Tuesday night is Dad’s night. Chelsea teaches a prenatal yoga class and doesn’t get home until after I’ve put Matteo to bed. So once she leaves for class, it’s Dad’s night. After walking around the neighborhood looking at all the Holiday lights, we came home and cooked dinner together. I love food and cooking and I want my son to appreciate it too. I have made it a point through his life so far (2 years 9 months) to expose him to all aspects of food. From growing and buying it to cooking and eating it. My hope is that he will understand how eating a healthy well balanced diet can positively impact his life. This method has worked pretty well so far as he is an adventurous eater, who loves fruits and vegetables. 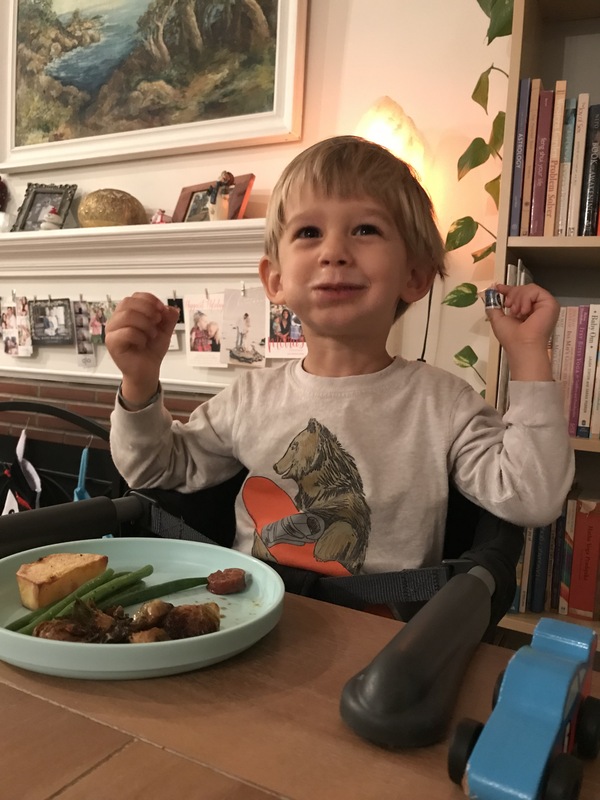 Tonight he ate green beans, roasted potatoes, chicken and brussels sprouts. When he eats a protein, I say, “this will make you strong”. When he eats a vegetable, I say, “this will keep you happy and healthy”, when he eats fruit I say, “this will give you energy”. The carbs are never a problem for most kids. Getting young kids to eat rice, pasta or bread doesn’t really seem to be an issue for most parents. It’s the vegetables that are the most important for mental and physical development, but also the most challenging to get kids and even some adults to eat. 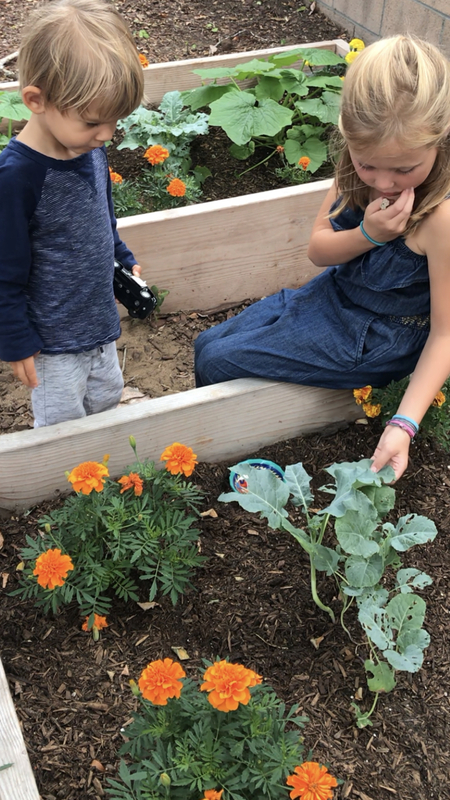 Involving Matteo in the growing, harvesting and cooking of vegetables has really helped cultivate his love of vegetables and food in general. Back to the brussels. They have been a chef/foodie thing for the last several years as it seems like just about every restaurant I go to has their own riff on this vegetable that when I was a kid, no one really ate. I make it a point to order them as a side whenever they are offered. They are all a little different and I kind of like them all. My ideal brussels sprout side dish has a crunch from a toasted nut, a sweetness from a grape or berry and then the charred crispy vegetable, all of this married together with a sweet and tangy sauce. 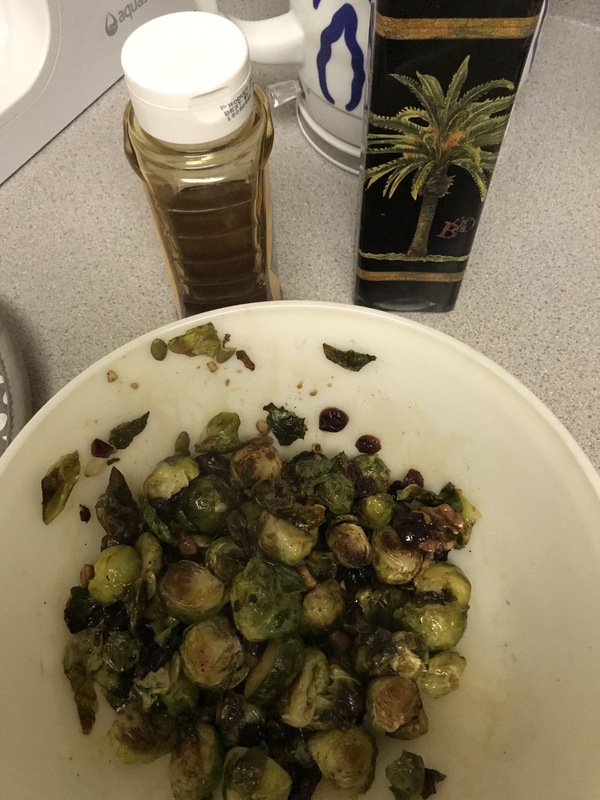 Trying to perfect my homemade brussels sprouts to combine my favorite aspects of all those that I’ve had out and about has been a labor of love for the last several years. I’ve tested out different ways to cook them. From complex: steaming, pan frying and baking, to simple: baking at high heat. I feel like the other night I had a major breakthrough and wanted to share it with anyone else who enjoys these mini cabbages as much as I do. First, I cranked the oven to 425 and prepped the brussels by trimming the ends, cutting them in half and rinsing them in the colander. Then I tossed them in olive oil with some salt and pepper and placed them flat side down on the baking sheet. I also cut potatoes into 1/2″ wedges and tossed them in olive oil with salt and pepper as well and put them on the same sheet. 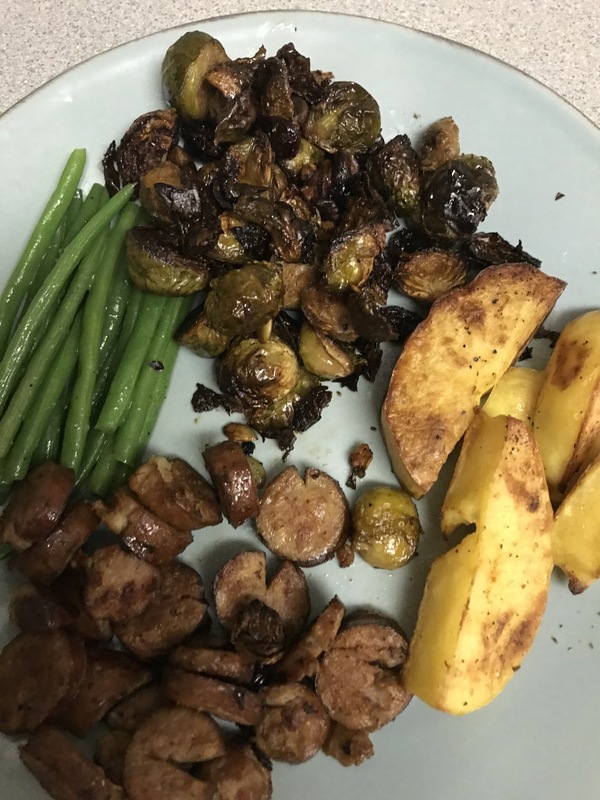 After 20 minutes, I flipped the potatoes and tossed the brussels around. Lately I have been adding chopped walnuts and cut up grapes, but since I didn’t have any, I added some of trader joes omega mix, which has dried cranberries, walnuts and pumpkin seeds and that turned out great. After 10 more minutes, about 30 minutes total (checking because ovens vary) I took out the brussels and put them in a bowl. Then, I added honey and balsamic vinegar to the bowl and tossed everything together. I shook the potatoes around and placed them back in the oven for a few more minutes until they were crispy on the outside and soft in the middle. I steamed the green beans and then tossed with a little butter, salt and pepper. For the chicken sausages I cut them into little circles and pan fried them according to the package directions with a little olive oil. If you’re not into chicken sausages, I also make the same dish with salmon and it goes really well. Matteo and I both enjoyed our dinner and ate everything on our plate. I came out from putting him to bed and Chelsea had come home and devoured her plate that we left for her and she said “that was awesome, I really loved it” and she doesn’t just throw out compliments. If she is saying it’s legit, then it truly is. It was an easy dinner to make and I got everything Organic from Trader Joes. Try it for yourself and let me know what you think. Heat oven to 425°F. Meanwhile, trim the bottoms from the sprouts and cut each one in half through the stem. Add olive oil and salt and pepper and toss to coat. Arrange them cut-side down on a rimmed baking sheet and place in oven. 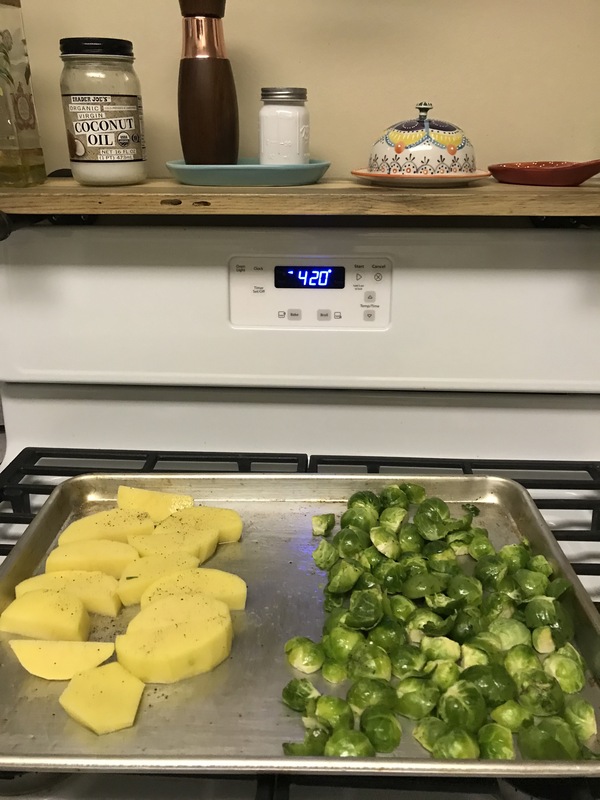 Roast, for 15-20 minutes, then add walnuts and grapes or TJ’s omega mix and continue to roast until the leaves are dark brown and crisp and the undersides of the sprouts are browned, 25 to 30 minutes total. Take them out and put in a bowl and drizzle with the balsamic vinegar and honey and toss to coat. Serve immediately. Yum.